Is there no limit to the tolerance margin in Apple Stores? After comedian Mark Malkoff brought his pet goat into an Apple Store, another guy found out that Apple Stores will in fact service his knock-off MacBook Air. And no, we are not talking about counterfeit Apple Stores in China, although the store in question was located in China. 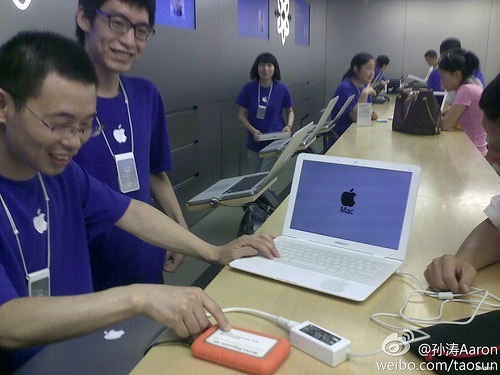 Per this report from the Chinese forum Sina Weibo, relayed by MIC Gadget, a Chinese guy brought his laughable MacBook Air knock-off to Apple’s flagship store in the Shanghai’s Pudong district. An Apple Genius not only agreed to repair the poor guy’s computer, but also posed for a shot which is now making the rounds on the web. From the looks of it, the Genius appears to be genuinely surprised by just how closely the rip-off Air resembles the real one. Yup, knock-offs are getting sophisticated these days.